Observations made by NASA's Dawn spacecraft, which has been orbiting the dwarf planet since March, suggest that Ceres' many bright spots could be made primarily of hydrated magnesium sulfates. Here on Earth, magnesium sulfate is sold as Epsom salt, a popular home remedy for a variety of ailments, including sore feet and joint inflammation. 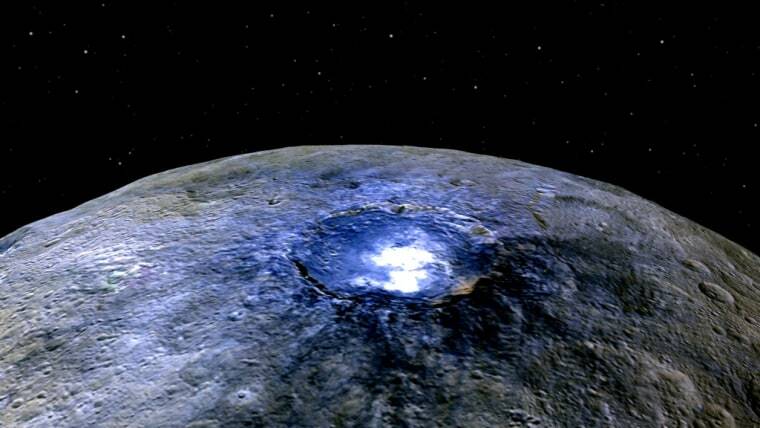 The study team, led by Andreas Nathues of the Max Planck Institute for Solar System Research in Germany, counted 130 bright spots across the surface of Ceres, which, at 590 miles wide, is the largest object in the asteroid belt between Mars and Jupiter. The nature of the bright spots has spurred a great deal of speculation over the past year or so, with most scientists positing that they're composed of water ice or some type of salt. The framing camera data bolster the salt hypothesis, Nathues and his colleagues report in the new study, which was published online Wednesday in the journal Nature. The closest match for the middle of the brightest spot in 56-mile-wide Occator Crater — which harbors the most dramatic and most famous collection of Ceres bright spots — is a type of hydrated magnesium sulfate known as hexahydrite. This interpretation is not ironclad, the study team stressed. But the picture may begin to clear up after Dawn starts gathering data later this month from its fourth and final science orbit around Ceres, which lies just 230 miles from the dwarf planet's surface. This is a condensed version of a report from Space.com. Read the full report. Follow Mike Wall on Twitter @michaeldwall and Google+. Follow Space.com @Spacedotcom, Facebook or Google+.